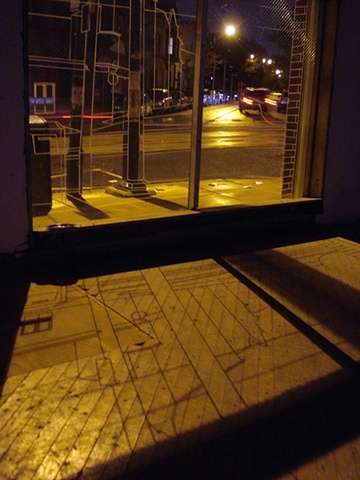 In the project Tracing, Nicole Herbert used thin white tape to trace the outlines of reflections in the windows and doors of 3848 Lancaster Avenue. Depending upon position of the person viewing the work, the relationship of the tape drawing to the reflected view changes. From one vantage point, the tape lines up with the reflection, but in every other position, the tape is out of line, in varying degrees, to what’s reflected in the window. The fixed outline of the reflection invites pedestrians to pause in otherwise transitory situations and consider their shifting relationship to the static tape.